Prof. James Tour’s research lab in Rice University is one of the leading graphene research groups in the world, with several key technologies first discovered and developed there. Professor Tour is involved with several application areas – from de-icing coating to energy storage and quantum dots production. Prof. Tour was kind enough to share his time and update us on the latest research and commercialization efforts at his lab. The Tour group is now commercializing two of its key technologies. First up is the laser-inscribed graphene (or LiG), which was reported first in 2014. This is a process in which graphene is formed on a flexible polyimide film using a room-temperature laser-based process. 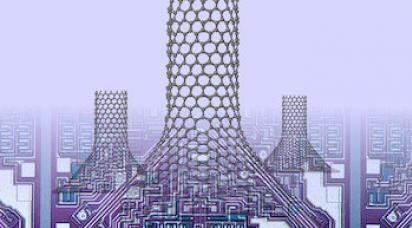 It is possible to pattern this graphene to create devices and as it is formed on a flexible film this easily enables flexible electronics applications. One of the interesting application areas (developed in collaboration with the Ben Gurion University in Israel) is water filtration – separating oil and water. 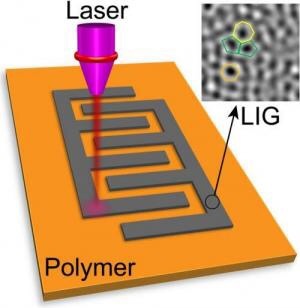 The idea is that two 20-micron layers of graphene coatings are fabricated on the polyimide – one on each side. One side is made hydrophobic and one hydrophilic. Both the graphene and the polyimide are made porous which results in the separation of oil and water. This is an efficient method to perform the separation and the graphene-enhanced membrane is relatively easy to manufacture. Other applications for LiG include supercapacitors (see this recent micro-supercapacitor research) and many others that can take advantage of these relatively easy-to produce flexible graphene films. Tour also developed a 3D CNT / Graphene hybrid material that is very promising for energy applications. The first application targeted for this material is supercapacitors – and Prof. Tour says that these materials can lead to the world’s fastest charging supercapacitors, as charging speed can reach 500 volt/sec. The same material can also be used for battery anodes to enhance capacity and for fuel cells. There are many other exciting areas being researched at Tour’s lab. Quantum Dots production from coal has been licensed to Israel-based Dotz-Nano who’s now entering production. Tour is researching the possibility of using these bio-compatible GQDs as anti-oxident materials for medical applications. The lab is also looking into spinal-cord repair using GNRs. ← Max Planck ~ Father-Founder-Messiah(?) of Quantum Physics ~ Do You Quantum?